Salla is a municipality of Finland, located in Lapland. 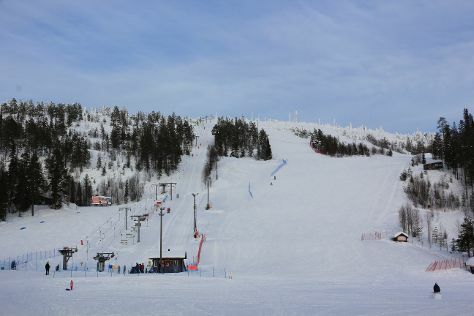 Start off your visit on the 7th (Thu): hit the slopes at Salla Ski Resort and then learn about all things military at Salla Museum of War & Reconstruction. To see traveler tips, other places to visit, maps, and other tourist information, read our Salla day trip website . New Delhi, India to Salla is an approximately 18-hour flight. The time zone difference when traveling from New Delhi to Salla is minus 3 hours. In February, Salla is colder than New Delhi - with highs of -6°C and lows of -13°C. Finish your sightseeing early on the 7th (Thu) so you can travel to Rovaniemi. On the 8th (Fri), look for gifts at Your Piece Of Finland, see exotic creatures in open habitats at a safari tour, and then find something for the whole family at Santa Claus Village. Keep things going the next day: see Santa Claus Office, Head underground at Syvasenvaara Fell, then get engrossed in the history at Arktikum, and finally make a trip to Lordi's Square. To see ratings, more things to do, where to stay, and tourist information, read our Rovaniemi road trip planning website . Traveling by car from Salla to Rovaniemi takes 2 hours. Expect a daytime high around -6°C in February, and nighttime lows around -11°C. Finish your sightseeing early on the 9th (Sat) to allow enough time to travel back home.